Veggie of the month: Peas! Greetings folks. We’ve been so busy here that the blog has been neglected. I’ve finally had some time to get a veggie of the month post in…enjoy! Peas as tall and as far as the eye can see. Here at the farm, we are about to start harvesting bucketloads (literally!) of peas! They are both a CSA and Market favorite. Because the peas did very well for us last year, we decided to do two plantings of them this year in order to extend the otherwise short harvest. 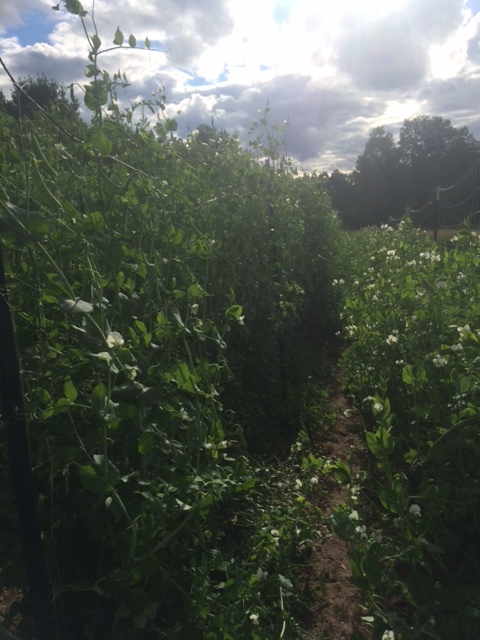 Our trellising system is about 8 feet high, so we looking forward to some very tall pea plants! There are three main types of peas: shelling peas, snow peas, and sugar snap peas. All three are delicious, but at EverGood, we stick to growing sugar snaps. Peas are an excellent source of A, C, K and B vitamins, and are also high in iron, potassium, and phosphorus. These little guys pack a nutritional punch!